If you thought summer in London’s parks was all about football and cricket, think again. 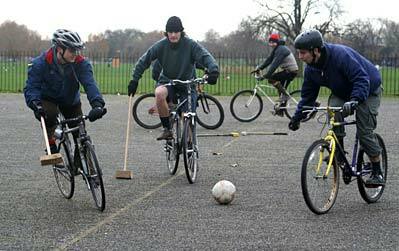 It may sound like a game created by students after seven pints of cider, but bicycle polo is about to take off. It first hit the London scene in 1895 and in 1908 it even featured in the capital’s Olympic Games line-up. Today it is played from Canada to Â­India via Clapham Common and perhaps not unsurprisingly, Chelsea. “It’s not all about Cartier and being toffy nosed though,” declares Tim Dobson, captain of the Chelsea Pedallers, the team at the centre of London’s bicycle polo revival. Teams can field as few as two players and as many as eight. Each is armed with a wooden mallet to hit the ball on a football pitch with a goal at each end. With each match split into four chukkas of 15 minutes, the idea is to bash, dribble and volley the ball into the goal. There are officially three variations of bicycle polo with slightly different rules, plus a more maverick element with the sort of disregard for regulations that would send the pony polo set into convulsions. In January a match of “Punk Polo” was held on Clapham Common’s netball courts. The two rules – to hold mallets in right hands only and not to let feet touch the ground – existed as much for creating order as for Â­allowing players to demonstrate their great skidding technique. The same group – from Oxford, where the bicycle polo scene is thriving – is organising another tournament on 8 July to coincide with the launch of the Tour de France. Add to this the fact that London’s bike Â­couriers frequently join up for matches and teams with names like the Axles of Evil compete, and suddenly you’ve got the perfect anti-Â­establishment sport. Of course, if you’re remotely interested in learning traditional polo, then this is also a great and cheap way to start. Royals, including Zara Phillips and princes William and Harry, have been known to have a bash, while other enthusiasts turn to their bikes on weekends for Â­training practice. So don that fake Rolex with pride, crack open that bottle of cava and prepare to say goodbye to your spokes. Bicycle polo is coming to a park near you. This entry was posted by Doug D on October 12, 2008 at 1:01 am, and is filled under Bike Polo, England, Media/Press. Follow any responses to this post through RSS 2.0. You can leave a response or trackback from your own site.